These SPD pedals seemed like a good idea at the time. Clip in when it’s warm and I’m wearing my Shimano SPD sandals, or spin the pedals 180 degrees when it’s cold and I’m wearing my boots. The problem is I want to get on the bike and go. Not turn the pedal to the proper side before heading out. On the tandem? Double-sided SPD pedals work great. On the World’s Heaviest Fisher? Do I look like I’m in a hurry? Double-sided flat pedals: that’s the ticket. Maybe I’ve been reading too much Grant Peterson, but there’s something to be said for pedals without toe clips or clipless mechanisms. Just get on the bike and ride. So the only question next year (because I already broke the piggy bank this season) is whether to install tried-and-true MKS Touring pedals or very-low-profile-and-plenty-wide VP Thin Gripsters. This entry was posted in Equipment, Report from the road and tagged boot, Grant Peterson, MKS Touring, pedal, Shimano, SPD, VP Thin Gripster. Bookmark the permalink. No one who wants to “just get on the bike and ride” takes the time to put on tights. I’ve been coming to this philosophy from the opposite direction. There are bound to be inconsistencies. And the tights were toasty. Speaking of simple, I’m getting ready to reassemble the Trek 2300 as a single speed using a White Industries Eccentric Eno hub. I never liked the idea of the “double-sided” pedal, or (road) pedals with cleats weighted so they must be “kicked” into. I left toe-clips behind to avoid that. 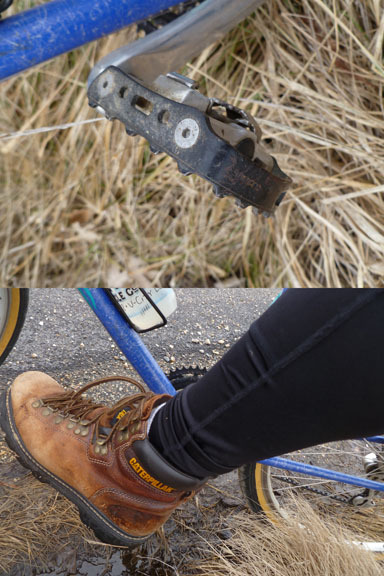 That’s why, in the 22-years I’ve been using clipless, I’ve used either SPD or Speedplay pedals with cleats on both sides. Just stomp and go. Like woo, I have an around town bike with platform pedals. Yeah, no toe clips here, either. Though I remember thinking they were pretty neat back when I was nailing steel cleats onto the soles of all-leather cycling shoes. I use a pair of Velo Orange touring pedals. I like them better than the Grip Kings (which I also have) and they work well in the wet. I trust them almost as much as my Speedplays in that I don’t hesitate to stand up on the pedals. They’re very light and fit my wide feet comfortably. The MKS Touring pedals remind me too much of the pedals I had as a kid and all of the shin “incidents” I had with them. Good feedback. I’ll add Velo Orange to the research list. I use plastic gusset platform pedals with plastic notches to keep the feet from slipping. They are very comfy and really work well in preventing the feet from slipping when it’s wet. I wouldn’t use clipless pedals even if they tried to pay me for it. I like lying on the ground from time to time, but not with the bike attached to my feet. So, another vote for freedom of movement. From what I read online, it sounds like many transportation cyclists like to keep their pedals simple. Wonder if there’s more interest in pedal attachment systems in hilly terrain or longer (5 miles plus) commutes. If I’m going slow, I prefer flat pedals. For me, slower trips generally mean errands, sight seeing, city riding (lots of stops), etc. Also, I’ve yet to find a pair of clipless shoes that are truly walkable. For faster rides, no matter the distance, I prefer clipless. If I’m going “fast”, my feet hurt when using flat pedals. The rigid soles of my bike shoes keeps the foot pain away. When I was commuting 2.5 miles to work, I still used clipless pedals and kept street shoes at work. That said, I waffle between wishing I never used special bike clothes/shoes and wishing I always used them. That’s the question, isn’t it: When does technology turn from useful tool to burdensome obstacle? How much is enough? I’ve been drawing lines, and shifting them, since the 1980s. Regular pedals are like a Toyota Camry, basic and good. Great for going to pick up kids or groceries. Clipless pedals are like a Porsche, great when the road is smooth and you don’t need to carry much. Both are good, Camry better for 75% of the time. I’m assuming the Camry’s the choice when you’re not taking it off-road. I like the Cat boots … do you work there? Fourteen years. The boots are almost that old.